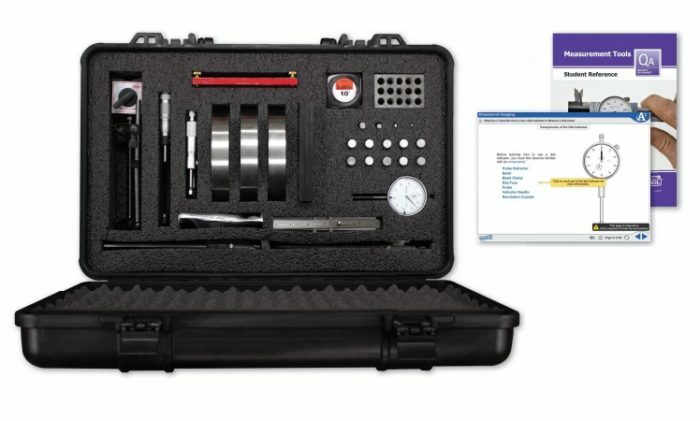 Amatrol’s Portable Fundamental Measurement Tools Learning System (990-MES1) introduces the fundamental principles of measurement including basic measurement, precision measurement, direct gauging, indirect gauging, and dimensional measurements using both the U.S. customary system as well as S.I. metric system. Understanding how to perform accurate measurements is relevant to technical careers such as quality control inspector, machinist, manufacturing engineer, operations manager, and production technician. The 990-MES1’s compact size and durable case also provide for safe storage when available training space must be used to teach other topics. The 990-MES1 uses industry-standard measurement tools used for various technical career paths including manufacturing, engineering, science, and medical technology. This learning system includes dial and digital calipers, micrometers, steel rules, dial indicator with magnetic base, a gauge block, and small hole gauges. Additional measurement components, such as rectangular plates, shapes of varying dimensions, and disks with machined lips are used to help learners use measuring devices to gain hands-on practice and skills. Just to name a few specific measurement skills that learners will develop, the 990-MES1 teaches converting between U.S. customary units and SI metric units, measuring the outside dimension of a part using a micrometer, calibrating a dial caliper, mastering a dial indicator, collecting and displaying data using data acquisition software, histogram creation and analyzation, control chart creation and analyzation, and geometric dimensioning and tolerancing. Learners only need a small amount of desk space and a computer to study vital measurement-related industry skills. Its compact size and durable, hand-held case provide for safe storage when your limited space must be used for teaching other subjects when the measurement training system must be transported to a different location in the facility for use. A sample copy of the Portable Measurement Tools Student Reference Guide is included with the learning system. Sourced from the multimedia curriculum, the Student Reference Guide takes the entire series’ technical content contained in the learning objectives and combines them into one perfectly-bound book. If you would like to inquire about purchasing additional Student Reference Guides for your program, contact your local Amatrol Representative for more information.